World handball power house Denmark could tour Kenya for a training camp and a series of coaching clinics early next year. This is according to Kenya Handball Federation Secretary Charles Omondi who said talks are at an advanced stage between the Danish Embassy in Kenya and Denmark’s Handball federation to have the team tour Kenya. Omondi says if successful, the tour will greatly benefit Kenya as the federation plans to lay down structures that will guide the development of handball across the country. Omondi was speaking to michezoafrika.com during the finals of the Inter University Handball tournament in Nairobi at the Ruaraka grounds where Kenya Polytechnique emerged winners after defeating Moi University. “We are working closely with secondary schools as we plan to roll out proper structures that will help in the development of handball in Kenya. News of the Danish team visit is very welcome as it will help us develop our skills not only at the national level but how to tap and nurture talented players. We are in close contact with those involved and they have assured the Danish embassy in Kenya is directly involved in the plan” Said Omondi. 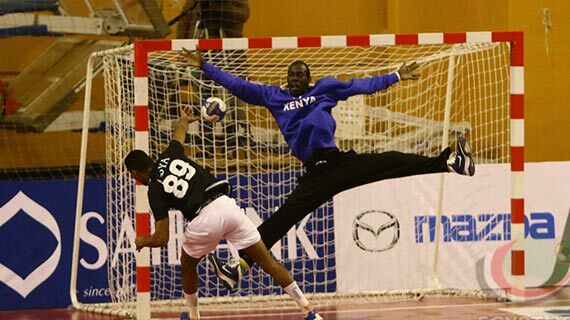 Omondi further lauded the growth of Handball in Kenya saying there is talent across the country though resources have continued to hamper their efforts of identifying and developing the same. “ Our teams did very well at the All African Games in Maputo. Top Kenyan clubs Cereals both men and women also clinched double gold medals in the recently concluded Zone five clubs championship in Tanzania, this is a sign that the sport has registered a significant growth in standards, but we have a long way to go.As a federation we are working towards ensuring we achieve even better standards.” Added Omondi.